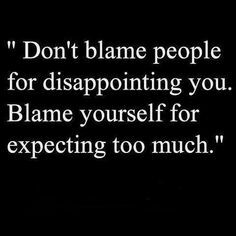 Learn to expect less from humans | Life, oh life! Fast forward to lunchtime and a brother offers to buy me lunch and I couldn’t say no to the offer. So, he makes a call to the food supply lady and he orders for two. One hour down the line the food aint here yet and hunger pangs start attacking me. Some people can be quite slow and the most irritating thing is they always give an excuse. And more often than not, the excuse is quite lame and you want to slap the devil outta them. Remember I was not anticipating any food but now that I knew food was forthcoming, my stomach juices started flowing waiting for something to digest. Finally I heard her voice in one of the offices and I jumped outta mine just to make sure my plate doesn’t end up in the wrong hands. I uttered a few words of displeasure at her slowness, never mind my plate was paid for. I later dug into my plate but I am quite a slow eater so, 30 minutes down the line I am still eating. Do you remember when someone promised you something and they took like forever to deliver? That was me this afternoon. In worse cases they didn’t honor their promise at all and you were so hurt (I hate to imagine what would have happened if she didn’t show up). It is human to expect a lot from our loved ones and it hurts when they don’t deliver. It doesn’t hurt as much when a random guy didn’t honor their promise. I don’t know about you but I hate it when a loved one disappoints, it hurts more. I have however learnt not to put my hopes up when someone promises me something cus in the event they don’t deliver, the heartbreak will be too immense to handle. We would have better friendships and other relationships if we didn’t expect too much from them. Some of these relationships die because we expected too much from the other party and they were not able to deliver. What happens next? You decide this person doesn’t love or value me enough and that’s why they wont honor their promises. Yes, some people are not into you, some don’t give two rats asses about anyone else other than themselves but there are those that really try. But if you didn’t expect too much from the word go, you wouldn’t be hurt if they didn’t deliver. 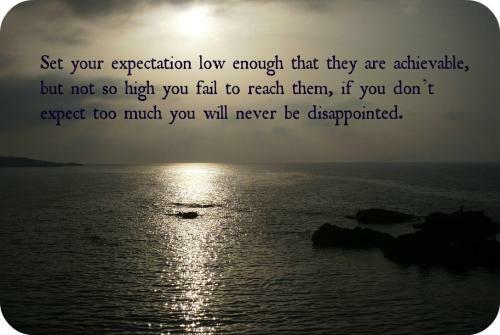 One huge frustration we all suffer from is expecting too much from others and too little from ourselves. Learning to count on you helps a lot in reducing frustrations. Be aware of your neediness (*chuckles), your emotions and your realistic or unrealistic expectations and you will have less heartbreaks to deal with. Expect less from humans and you will have no broken heart to mend. Pingback: SCRATCH MY BACK | Life, oh life!